First up was a game that he has been wanting to try - Splendor. 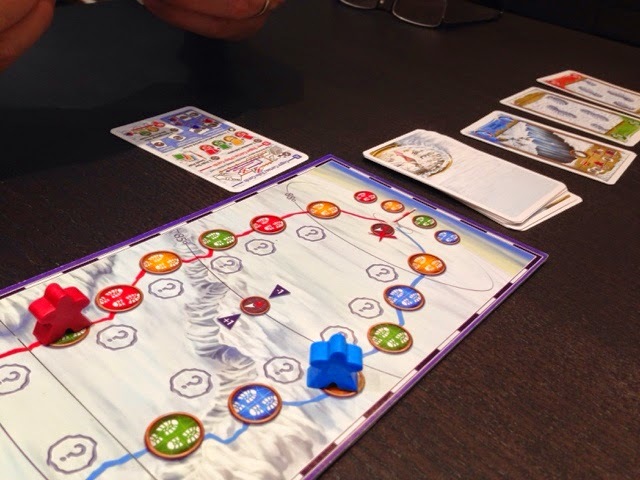 He had heard much buzz about it and had actually preordered it sight unseen, so well, getting to know how to play it always helps with the eventual opening up of the game. 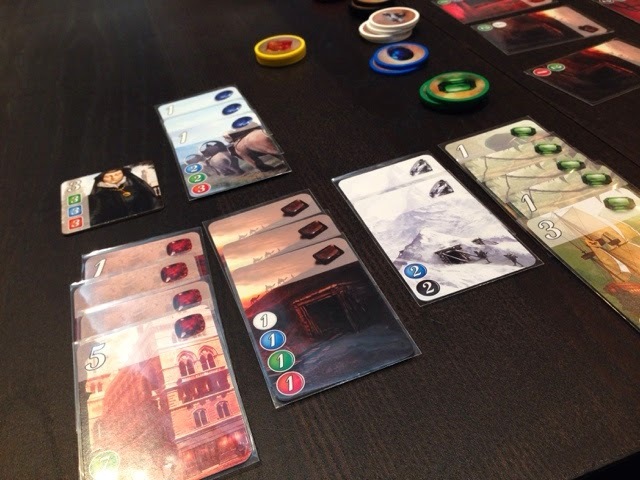 Splendor started off like all splendor games do, in silence. Haha. Stare at the cards, figure out what you want to do, and hope for the best. 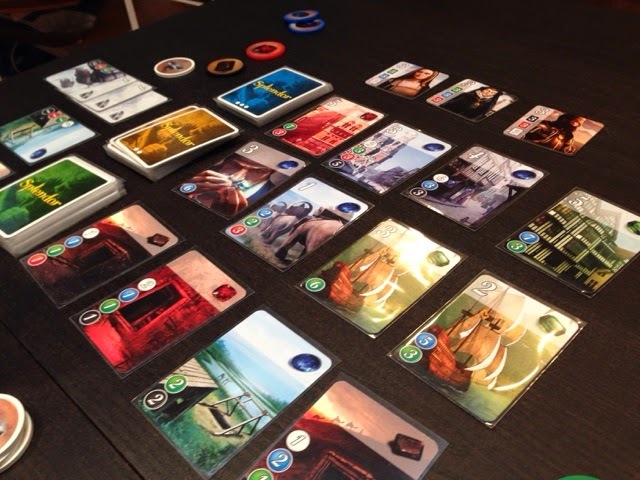 Splendor is an engine building game where players collect gems to buy gem cards that help them to further improve their gem engine. The more expensive gem cards are worth points and the game ends when someone reaches the 15 points - thereby the player with the most points is the winner. There are nobles that want to eyeball your lovely gems, so once you meet a certain set collection of gem cards, you will receive further bonus points. My friend really liked Splendor a lot. He said its definitely one for the family - just that there might be slightly more thinking than should be required for a family game. I'm not sure what to think of that statement. I think the thinking is only required to do well? But if its just for fun and interaction then I think it hits on all cylinders. I wouldn't consider Splendor thinky in any way, but I can see how you need to have a certain knack for being able to spot the shortest path to victory. Getting random gem cards will help to net you more random gem cards but likely of no significant value. We finished off our 2 player game pretty quickly and it was closer than I thought it would be. Ha! Score was 16-13 in my favor. What I do realize about Splendor is that I much prefer it when the majority of the cards require less of a mix and more of a specialized path. So for example, I prefer when the cards need 7 green and 4 red compared to 2 white 3 black 2 blue 3 red. This leads to less just buying the free card and build up to when you can grab the higher gems of wide ranging requirements. With the higher numbers you need to find a way to hoard more of 1 color or take a few gold and cards. Not sure about everyone else but that's what I feel makes the game more exciting and less of a "oh I open this card and now I can take it, whoo!" 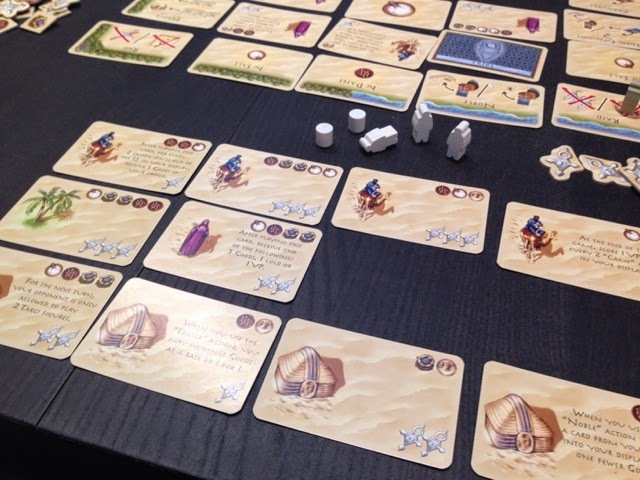 Up next was the main stay for the night - Robinson Crusoe. My friend is seriously considering buying this and wanted to give it another go to see if it is indeed something for his family. We decided to tackle the volcano island scenario as that was the only scenario that I have yet to play through. 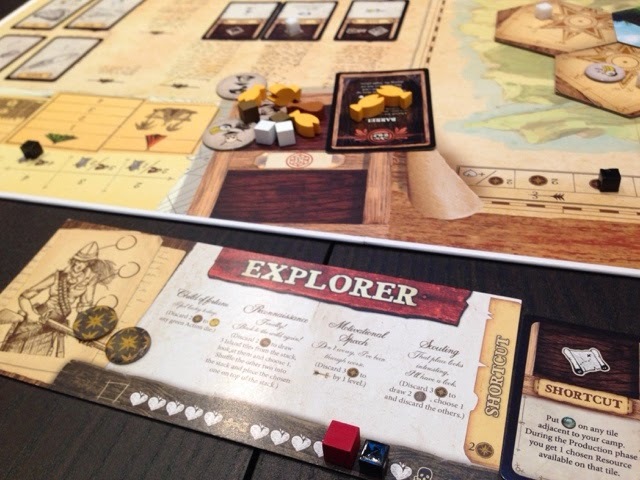 Now, I haven't touched Robinson Crusoe for a while already, and I was seriously afraid that I would butcher up the rules and present the game wrongly. But to my surprise, I think Robinson is the kind of game where, once you get it, you get it. Like cycling. You don't really forget how to play it. Could it be cos its an extremely thematic game? I think that could be the case. But well, just a few rules references and I was about as good to go as ever. Volcano island was all about exploring the island and finding treasures before we make a quick dash from the island. 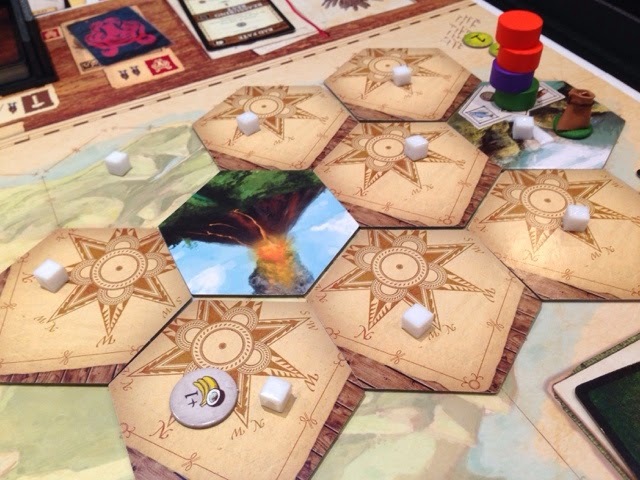 Under the 2 player conditions, we only needed to explore 6 island tiles and 3 totem tiles. Once done, we build the jolly boat and sail off with our riches! We started really well I would say, the pit was the saving grace for food, my friend did a great job ensuring we had a high weapon level for hunts, I got lost in the woods but came back with 2 treasures and high morale! Everything was fine except that wood was tough to come by. Midway through the game, I had forgotten that the island is supposed to get destroyed by lava! Starting from round 4! Well, we wouldn't have died anyway cos we kept moving west, just that we realized we had less space than we would have liked, and we needed our own shelter fast. So the panic started setting in a little ( also considering that we had not found any totem icons on our explored tiles yet, real bummer ). At that point of time, the volcanic ash was making everything very difficult for us especially the totem exploring. Anyway, long story short, we survived, barely. We took all 8 rounds, but we successfully completed the last totem search with each of us both having only 2 health left. 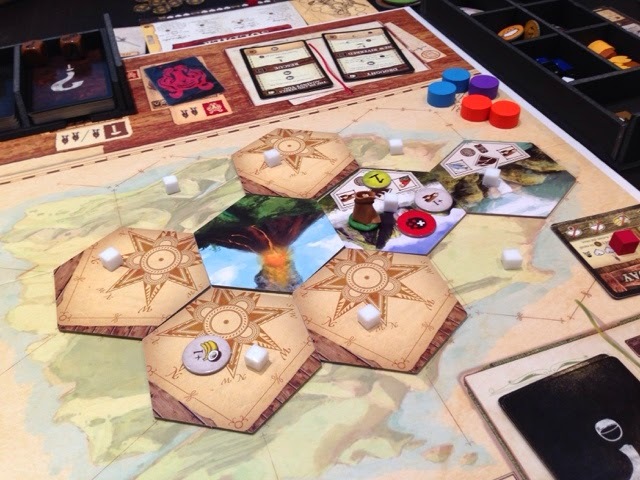 We were fortunate with some of the treasure draws as I think we encountered more treasure than traps or creatures, and also, my 2 treasure discovery tokens were very useful items ( free roof and barrel for health and food ). We ended with a resounding high five and I was quite delighted with our skin of the teeth escape. I think volcano island is one of the more exciting scenarios in Robinson. 1) Must fur be considered as wood? Or can it also be considered wood if required? We used 1 fur to build the shelter. Should it have been 2 fur instead? Fur = Wood? 2) The volcanic ash may be placed on unavailable spaces. I placed some of them on spaces where we haven't explored yet, and thus when exploring that space, we needed another token. I was thinking, could unavailable spaces be the half hexes on the board? Because we kinda ran out of spaces to put the ash as the board was full. That seemed strange. 3) One of the treasure creature cards asked us to stop drawing treasure cards. We needed to draw one more actually. So, we stopped and considered it a success. Yes no? Anyway, that was my first 2 player game of Robinson. Right now I think Robinson plays fantastic on all player counts. But if I had to choose, I think 3 players is the sweet spot. Our adventure continued from the deserted island to the south pole! I decided to take out one of my newer games - 1911: Amundsen vs Scott. 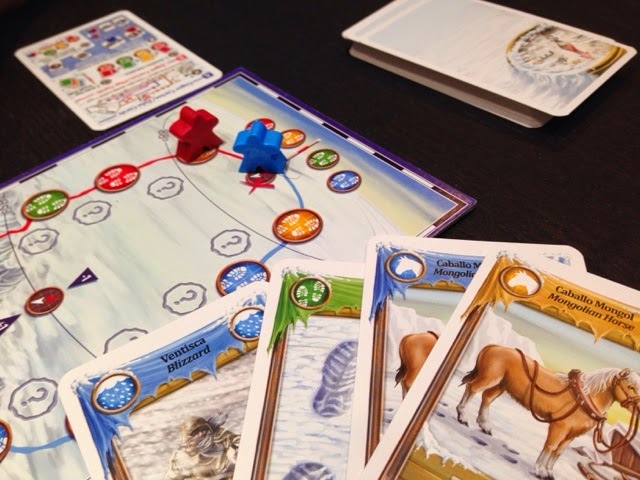 The game is about the non-fictional story about Amundsen and Scott's race to the South Pole. They both made it there - Amundsen first, Scott last - but only Amundsen made it back alive. Will history repeat itself? My friend took Amundsen (red) and I took Scott (blue). 1911: Amundsen vs Scott is a quick playing 2 player race game where each player is trying to be the first to reach the South Pole. On a player's turn, he/she may only execute 1 of 2 possible actions - draw cards or play cards. When drawing cards, the player may either draw the furthermost card from an open pile of 3 cards (this is free), or the player may draw 2 or 3 cards by discarding 1 or 3 cards from his/her hand. By discarding cards in such a fashion, some of the cards have abilities that trigger. For example, one of the cards let you steal a random card from your opponent. When playing cards, the player either plays cards for its color to advance towards the South Pole, or the player may instead use the cards for their abilities. Some of the abilities of the cards let you disrupt the opponents path towards the South Pole, or to limit their hand size for the remainder of the game. Scott pulls ahead! Soon to pass the 85th parallel where compasses no longer work! 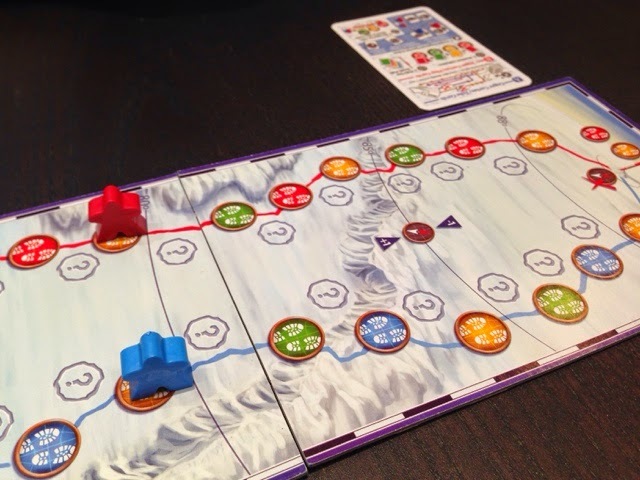 The game comes with a few expansions that may be freely added to the game, we didn't go into any of them on our first play, but one of the expansions allow you to play till someone gets back to their boat, another includes the factor of weather where good weather allows the players to draw more cards, or bad weather may lead to a loss of cards or a shuffle of cards between players or from the open pile. I bought 1911 as I had heard it had similarities to Jaipur - which I like very much. I am going to say that the games are not similar at all. The only similarity is how the players draw cards from the open pile. You can take a freebie or you can do an "exchange" so to speak. That's where the similarities end. 1911 plays completely differently to Jaipur. It is a race to an end point and you can tell who is clearly in the lead. Scott rewrites history! First to the South Pole on his Mongolian Horses! In a way, the game was slightly entertaining as it involved a good management of cards in your hand. Do you save a bunch of cards to make a big leap in a single turn? or do you play things one step at a time and instead focus on disrupting your opponent's plan? I felt like I was in a race, each step forward was monumental and pulling away felt good - even if it was for only a short while. The card abilities are nice, but they were very few. Not much of a mix to ensure that you can do things differently each time. But, at the end of it all, I was hoping for more. I do think playing with the expansions will help, but that would likely have to wait for another day. My initial gut feel is that getting the luck of the draw is crucial, the type of cards available also determine your strategy, and that there is not much room to maneuver or to have a backup plan. You see what is available and just let things flow. I didn't feel that I had much decision points during the game, there were only a handful of times when I wasn't sure what cards I wanted or if I just wanted to move and stall on the card draw. I was really looking forward to this one, so I hope it gets another chance at the table. I had bought a few 2 player games recently, thinking that I had found good company for them, but, life throws you curve balls, so... well, whatever. On to the next 2 player game! The last game for the night was Targi! I've been wanting to play this since it got nominated for the 2012 SDJ Kennerspiel award. My, I've waited 2 years to play this game! Haha. Was it worth the wait? Targi is a worker placement set collection 2 player only game. On a player's turn, he/she places his/her 3 targis on border cards so that they form 2 intersecting points. It is the 3 targis and the 2 intersecting points that determine what actions the player may take that turn. In essence, you are using the direct placement of the 3 targis for fixed actions on the border cards, while at the same time trying to maneuver your targis so that their intersecting points fall on cards that are of interest to you as well - these cards get replenished when taken. From the moment I finished up my first turn in Targi, I knew it was a game I would love. And indeed I do. The worker placement aspect with intersecting points is a very clever mechanism. You are often torn between getting a resource you want or taking something less so that you can reserve the rights to buy a card that you also want. And because the spaces to place your targis are limited, you will often find yourself in your opponent's way and vice versa. So picking first and fast is important - that also leads to some element of pushing your luck as you hope your opponent is eyeing something else away from your intended location. The set collection aspect is also very interesting and difficult. Yes I may have formed two rows of 4 of a kind (pictured above), but I fought really hard for it. Finding the icon you want at the price you can afford is difficult and by the time you save up enough, it might be gone from the board. This game is quite simply an outstanding game design. It is by far one of the best 2 player only games that I have played. Targi takes a worker placement mechanism, combines it with area/action selection, throws in tight resource management, stirs in mandatory set collection (with abilities!) and churns out a very tight and rewarding 2 player experience. If you have a buddy or a friend who will sit down for a game or two with you solely as 2 players, then this is one game I cannot recommend enough. 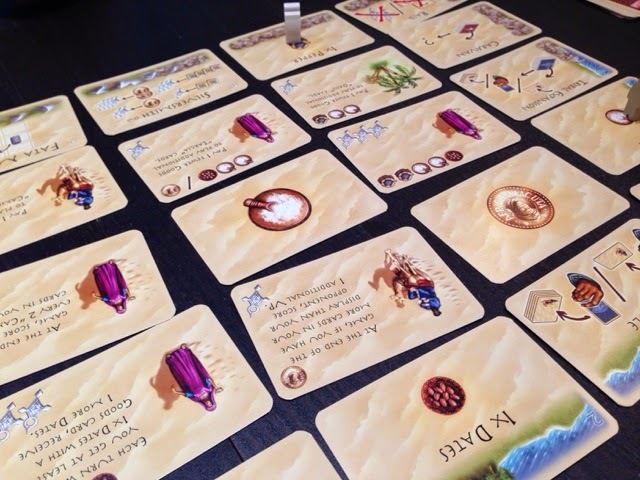 Yes, there is a chance that the game may feel pretty similar after multiple plays as the border cards don't change, but I think Targi still has legs for many many rounds of gaming goodness.